FRAMED PRINT. 22x18 inch (56x46cm) Framed Print with Black Satin with Off-White Digital Mat. 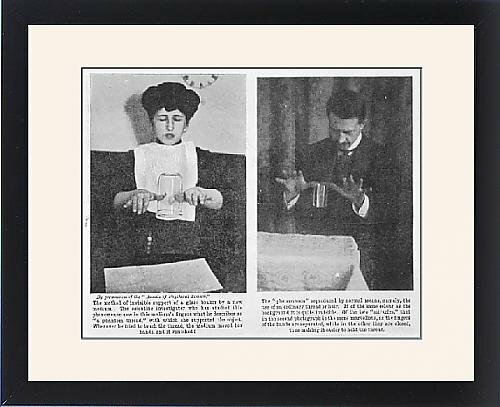 Artwork depicting MEDIUMSHIP/MARRIOTT. WILLIAM S MARRIOTT EXPOSES Marriott simulates Polish medium Stanislawa Tomczyk s levitation of a glass tumbler in full light. Shipping from USA. Artwork Description... WILLIAM S MARRIOTT EXPOSES Marriott simulates Polish medium Stanislawa Tomczyk s levitation of a glass tumbler in full light.